Phone: (888) 627-8148, say you want the room block for Somerset Harp Festival. Rooms available for Thurs-Mon. Not Wed.
Our Room Block for the discounted at the $119.99/night rate is valid from Jan. 1-June 17 or until the block is full. As of 4/22 we are close to selling out. As of 4/1/19 Wednesday room block at the Sheraton is Sold Out at our discounted rate. The Hyatt House (next door) has given us a small number of rooms for Wednesday night at the $119/night rate. Call them at 1-888-430-0380 and use promo code G-SFHF to get this rate. If you book at the Hyatt we offer to lock up your harp in our storage room so you don't have to schlep your harp back & forth. You'll save money by using our room block. We got you a great deal so take advantage of it! It's so convenient to just go up to your room after a long harping day. It's a really nice place to stay and you deserve it. Overall it supports the festival's use of workshop, exhibit hall and concert space. The hotel does not have a shuttle that goes to any of the area airports. We suggest that you fly into Newark International Airport. If you're game to take Mass Transit there are a few options listed below. We have contacted State Shuttle which operates out of Newark (and JFK) and they have vans suitable for transporting you and your harp. They only need 24-hr notice on a reservation. 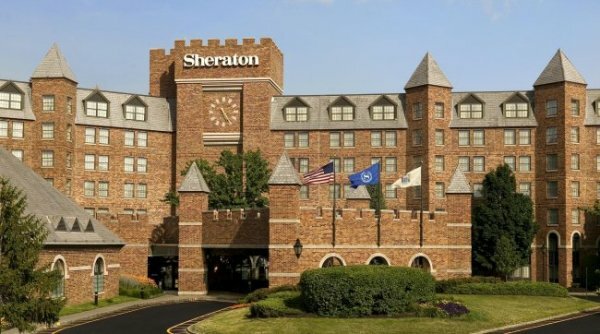 Cost: $52 for a trip to the Sheraton Parsippany (includes tax & tip). 2 passengers, same trip: $65; 3 passengers $71. Call 1-800-427-3207 (if calling from outside the US, dial 973-347-3144). Drive time from Newark: about 30 minutes. Drive time from JFK: about 1 hour. See below for train/bus mass transit options. Uber and Lyft are also options. Don't forget we have the harp loaner pool available to those for whom traveling with the harp would be a real nuisance. The website for New Jersey Transit is very helpful once you actually know what you're looking for. However, if you call them, you'll find a very friendly helpful person who will help you get to the Sheraton at 199 Smith Road, Parsippany, from various points in NY and NJ. That's how I got most of the information on this page--and then their website made more sense. NJ Transit toll-free number: 800-772-2287. The Sheraton has a shuttle that does pick-ups within a 5-mile radius of the hotel, Monday-Friday 7am-10am and Monday-Thursday 5pm-8pm. This includes the Morris Plains Train Station but only after 5pm (sorry, this is a change from last year 7/18/18) and various points along Rt. 46. The hotel's main phone is (973) 515-2000. PLEASE CALL THEM TO CONFIRM PICK-UP LOCATIONS AND TIMES. From: Amtrak trains into New York City's Penn Station, take the NJ Transit Morris/Essex train from Penn Station to Morris Plains NJ (there is a transfer on some trains at Newark's Broad St. station). The Sheraton has a shuttle that picks up at the Morris Plains train station but only after 5pm (sorry, this is a change from last year 7/18/18). Call the Sheraton at (973) 515-2000 to arrange pick-up. The Morris Plains train station does not have an elevator or escalator, only stairs (if you're carrying a harp, it's a haul). From the airport you can take NJ Transit trains to Morris Plains. Check the schedule because you'll have to transfer at Secaucus train station (a very short hop from the airport) to get the Morris/Essex train to Morris Plains (some of these trains also stop at Newark Broad Street station where you have to transfer again--so check it out). Morning trains express from Secaucus to Morris Plains take 80-90 minutes. You can take the train from Newark Broad St to Morristown station then transfer to the MCM2 bus to t the Morris Plains train station. You can take either the 79 or 29 bus, which can drop you at various points along Rt. 46, near the hotel, and then call the Sheraton at (973) 515-2000 to arrange pick-up during Rush Hour timefrrames. Lakeland Bus Lines (phone: 973-366-0600) runs commuter lines to Parsippany from Port Authority in New York City. You'd be taking the Rt. 46 Westbound bus to Parsippany. There are a variety of stops. If you are flying or coming by train to the festival and can't bring a harp, we will have a small pool of loaner harps available, which can be signed out for the day at the Registration Desk. First come, first-served. Check the sign-out list at the Registration Desk by 9am. Please indicate your need for a loaner harp on the Registration Form or email us so we know of your intentions to use the harp pool and can make plans to have enough harps available. Deadline for applying for a loaner harp: May 1 (the early-bird deadline). Do you have harps or other music products to sell?